Tired of making small cubes, are you looking for a challenge? Take your magnetic cube building skills to the next level with the NeoMagnetic Giga Cube! This set will enable you to build a 12 x 12 x 12 Giga cube, the biggest magnetic cube on the market! 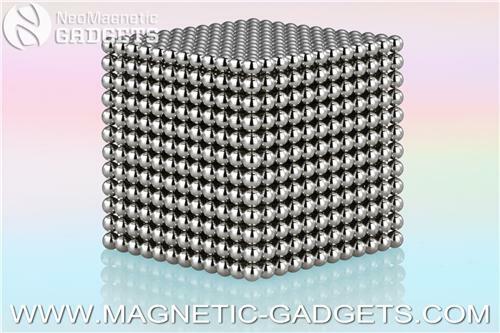 No matter if you want to build a Giga cube or get A-LOT of Magnetic Balls, the NeoMagnetic Giga Cube is a great deal!. Let the magnetic properties of the spheres guide you and build an almost limitless amount of shapes. No matter what you do, the basic principles of magnetism and mathematics will let you build geometric and complex patterns. Playing with this space age gadget is a truly unique experience, you have to try it to believe it! Coating: High quality triple coating (Nickel, Copper, Nickel) offers the best protection available against chipping and corrosion. These are the some of highest quality neodymium cubes on the market, trust us, we tried most of them! Our NeoMagnetic Cubes were custom made to meet the highest quality standards.